Archadeck of Columbus is in what many would call an enviable position. We have the opportunity to meet with homeowners around Columbus throughout the year and get to hear what they like, what they are looking for and what type of things they are contracting us to build in their backyards. As 2013 will soon be drawing to a close, we would like to share some of the trends we’re seeing on the front line. Over the next few weeks, we will be sharing these design trends for decks and porches also. This week we will look at hardscape trends. #1) Roofed structures over patios – This design trend has been a heavy hitter throughout the year and one we predict will continue into 2014. The reasoning behind the popularity of adding a roofed structure over a patio or hardscape area is because it provides a sense of an outdoor room. Pergolas have remained a top choice for a long time, but patio covers offer more protection from the elements and convey a more formal room setting. You don’t have to look very far to see the concept of the “outdoor room” in action; pick up any home and garden magazine and you will notice it is filled with design ideas regarding outdoor rooms. Everything from contemporary to rustic, outdoor rooms are what the “in” crowd is asking for in outdoor structure design. Aside from being aesthetically pleasing, outdoor rooms are highly versatile and functional because they can provide an outdoor escape for a myriad of recreational and entertaining uses. #2) Incorporating hardscape lighting – “Let there be light” seems to have been the unanimous request among hardscape homeowners. We have integrated tons of lighting into our hardscape designs over the past year. From lighting the risers of steps, pillars, seating walls and even into the soldier course through the use of lighted pavers, we have done it all! The allure of adding outdoor lighting into hardscape outdoor spaces is ambiance and enhanced safety. By adding romantic touches of light into a retaining wall, or paver patio for example, you can extend the function of the space. The beauty that comes from combining stone with lighting draws you into the space like a moth to a flame! #3) The use of non-standard pavers – What is that old saying, “the bigger, the better?” When it comes to the use of larger non-standard sized pavers among hardscape owners, this saying certainly rings tree. Traditionally, homeowners have requested their patios and hardscape structures be built using the standard 4 x 8, 6 x6, and 6 x9 sized pavers. 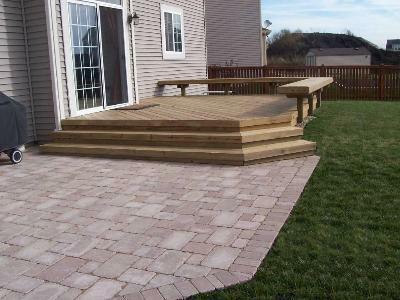 In 2013, Archadeck of Columbus has seen a huge increase in request for oversized pavers. The reason for the demand is because larger hardscape pieces lend more toward a natural feel and make the space look less like a typical patio. The downside to using larger pavers is that they can be overwhelming when using such large pieces. One option we use to overcome this is by using a paver rug option. Paver rugs are used to create a isolated section using inset patterned pavers. Paver rugs make wonderful design elements and look great in front of an outdoor fireplace, or to mimic the look of a rug under a grill or dining area — remember, creative touches make your design stand out! #4) Mirroring designs – Mirroring is popular among our hardscape customers. The concept behind mirroring is simple, everything is built as a mirror image of the other side of the patio. Mirroring is desirable because it gives people comfort in their outdoor space and balance is always an important factor of hardscape designs. 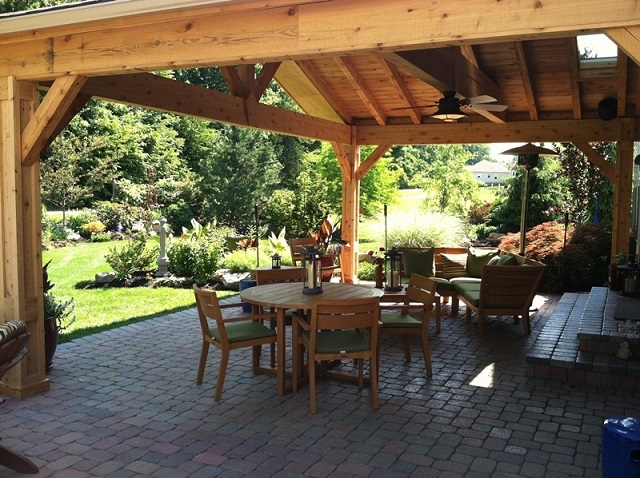 #5) Bordering options – Border usage is still very popular with patios. Adding a border gives a design finality and it gives the homeowner an opportunity to make their space original. We often change the color or texture of the pavers within a border and also mix solider course with sailor course to add character. #6) Color – When you think of paver patios, the vision of red brick looking pavers is probably the first thing that comes to mind. Stretching to think about more recent hardscape colors, you probably envision earth-toned colors – and you’re right. Earth tones are incredibly popular. But in the last year, we’ve also seen gray tones rise in popularity both as a primary color or as a great color for bordering in the soldier course. #7) Texture – Many different surface textures are available from relatively flat to coarsely tumbled or cobbled. What we’ve seen rise in popularity this year is the cleft surface texture. This texture is slightly uneven resembling the surface texture of natural bluestone. If you are starting to think about adding a new outdoor space to your Columbus area home, give us a call for a free consultation. 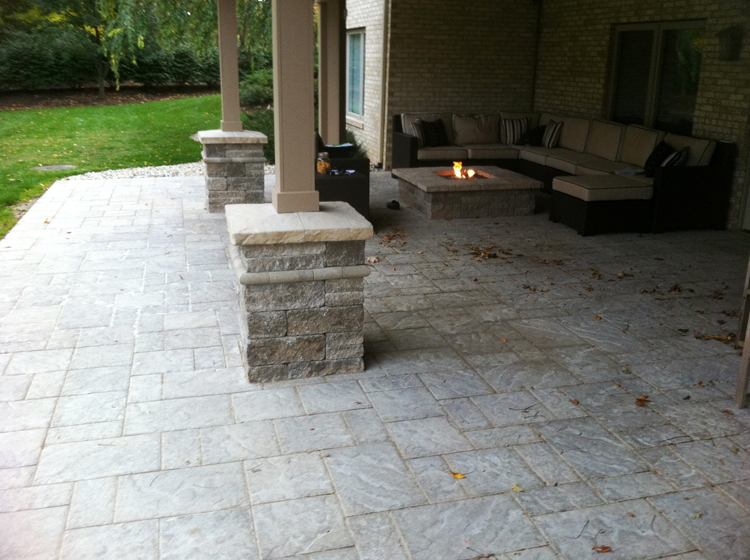 Take a look at some of our patio and hardscape photos on our website. Previous Previous post: Please, please start planning your spring outdoor living addition project now!